Gesi is my Belgian friend. He is a 71-year-old survivor of terminal cancer. He holds a black belt in Judo and 5th dan in Iaido. Gesi's professor is Ogura Noboru Sensei: 8th dan in Iaido, Kendo Kyoshi 7th dan, a consultant of the All Japan Kendo Federation. Although Gesi is a big fan of Japanese culture, his Japanese is quite limited, so whenever he writes a poem or a letter to his Sensei, he asks me to translate it. That's how I’ve got to know Ogura Sensei for over 7 years, via correspondence. This year, I had a chance to meet Ogura Sensei in person for the first time in Versailles, Paris. Despite his remarkable feats, he is a humble, polite, and jocular person. He taught energetically all day long for three days straight, giving detailed explanations and making humorous, but kind comments. He is, no doubt, a great Iaido practitioner and professor, but while talking with him, I had the impression that he is also a wise philosopher. What he told me was so simple, yet profoundly reflective, and regrettably, it is not easy to translate. During the conversations with him, I often felt “mottainai,” a sense of little guilty to keep what I heard all by myself, but I thought I'd better to translate and share his teachings with others. For Ogura Sensei, those who quit Iaido when they fail a promotional exam may have the wrong goal. Of course, it is crucial for disciples to work hard, trying to gain mastery of physical movements and pass a grading, but Iaido is much more than technical proficiency, he remarked. Simply stated, the essential core value of Iaido is about cultivating oneself and becoming a better being, entailing daily commitment, eagerness, and perseverance. The essence of Iaido or the spirit of mononofu (meaning “all what relates to being a samurai”) is to acquire a harmonious spirit and to learn about respect and consideration for others. Also, I was impressed by his mindfulness of all human physiological functionings, or his intelligence of kinesthesia. He told that he holds his sword with his fingerprints that are designed to be nonskid, and also it is the (principally right) pinkie finger that gives the dynamic of movements. Those who practice bujutsu must know all these things, but for me it was new and very interesting to learn. Here is an excerpt of his comments on promotional examination in the article. The following points Ogura Sensei will be examining. This part (p. 63) is translated with permission from Taiku to Sports Shuppansha. Sho (1) dan Showing the right wearing and right manners; showing the right attitudes in the right sword movements or performing the right kata (forms); performing accurate nukitsuke (drawing the katana from the saya), kiritsuke (quick dispatch), and chiburi (removing blood from the blade), and so on to examine if one can perform the basics. 2 dan To be examined if one has instilled force in executing the sword movements, in addition to 1 dan qualification standards. 3 dan Being able to perform all the kata nearly perfectly; having learned the basics of position(s) of the imaginary opponent(s) and suitable distance(s), based on learning from written references and teachings from one’s Master. 4-5 dan Satisfying qualification standards of 3 dan; being able to show an extension of your soul in the sword movements, facing the imaginary opponents; instilled calmness, metsuke, kihaku (unmistakable determination to vanquish); the harmonious unity of ki (energy) - ken (sword) - tai (body); smooth and controlled movements; mastering in both kokoro and waza (mind/heart/soul and techniques). 6 dan and above Satisfying all the previous requirements; will be examined how to fight with swords against the imaginary opponents; being well acquainted with the references; will be examined all the physical movements (from the top of the head to the tip of the fingers) have “a life”; If the waza is not artificial, but performed in the real conditions - the waza is living and present; Instilled graceful air and dignity. Ogura Sensei’s dojo has been open for his disciples. When he was preparing to make his 3rd attempt to pass 8 dan, he first gave the regular keiko at night. After all of his students were gone, he switched off the light, re-entered his dojo after making a new bow, and did keiko in the darkness often after midnight. In this way, he achieved something nearly impossible. 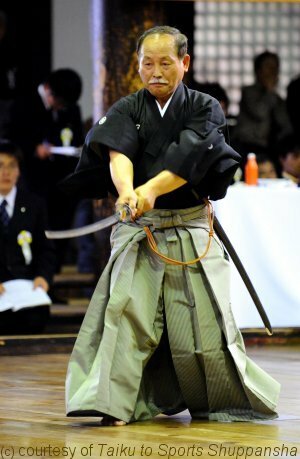 He said that he never fed up with nor gave up Iaido during his 46 year-old career of martial arts training, but he has been constantly attracted to Iai. Please note that the Sensei is against “sportification” of Iaido, but he emphasizes on spiritual aspects far more than technical proficiency. Compared to those who learn Kendo, the population of Iaido practitioners is much smaller, and thus he would like to promote the growth of Iaido. I hope this translation will be helpful for you. I would like to thank Jeffrey Marsten for his review. Please keep it up… Gambatte! Photograph courtesy of Taiku to Sports Shuppansha.